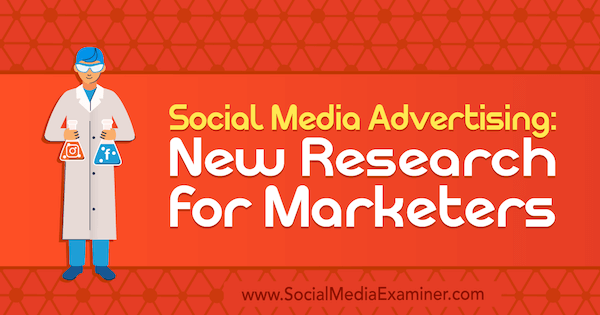 Social Media Advertising: New Research for Marketers by Lisa Clark on Social Media Examiner. Adobe Digital Insights’ 2018 State of Digital Advertising Report shows that social media ads drove three times more non-customers than existing customers to retailer websites as of the end of 2017. 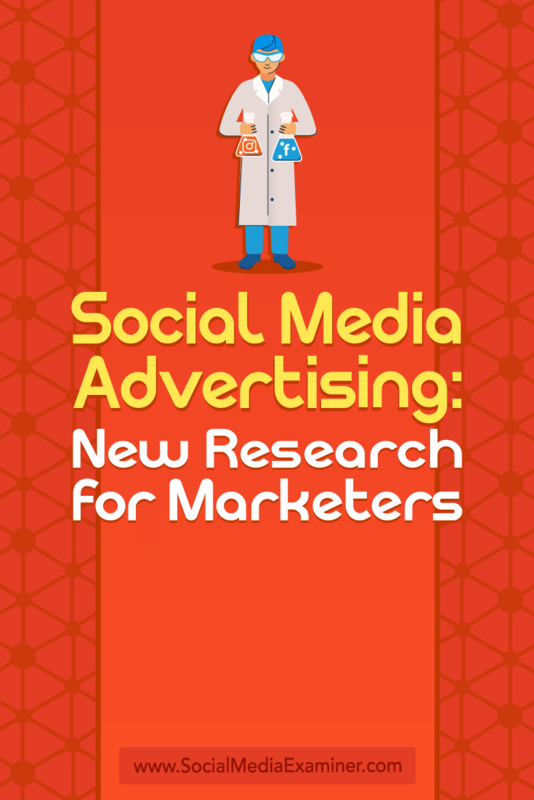 In short, people are looking at social ads and they’re clicking on those ads more than ever before. Takeaway: The effectiveness of paid social media as a customer acquisition channel isn’t declining. If you want to be part of the action and benefit with your own social media ads, you need to know where your target market is hanging out. Which social networks are they using and how are they using them? Once you have these insights, you’ll know where to place the bulk of your ad dollars to reach the people you want to reach. Facebook currently has 2.23 billion monthly active users and according to Social Media Examiner’s 2018 Social Media Marketing Industry Report, the platform is leading the pack by a wide margin when it comes to marketers’ preference for paid social media. 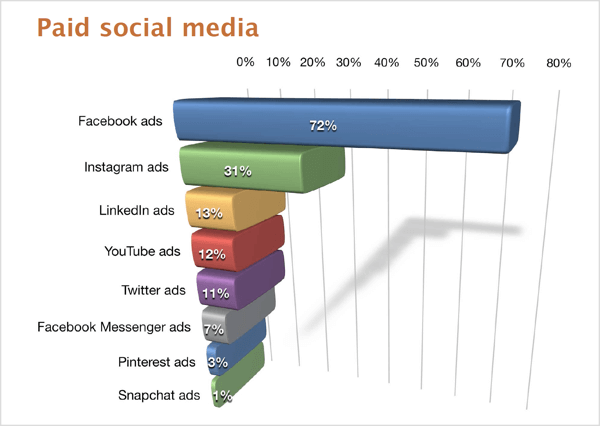 When asked which forms of paid social media they regularly use, 72% of marketers say they most often use traditional Facebook ads (7% use Facebook Messenger ads) followed by Instagram ads, which comes in second with 31% of marketers using paid ads on the platform. Beyond that, LinkedIn, YouTube, and Twitter are running neck and neck with 13%, 12%, and 11% of marketers using ads on these platforms respectively. Pinterest and Snapchat came in as last choices for advertising over the past year. While it’s one thing to benchmark your advertising against what other marketers are doing right now, it’s another thing to know what you should be doing in the future. Are there certain platforms you should have your eye on? Which ad platforms will your fellow marketers focus on in the next 12 months? While 85% of marketers said they weren’t using Facebook Messenger bots in their marketing when surveyed, 51% of those said they plan to use them in their marketing in the future. Takeaway: While Facebook is clearly the most used social platform for paid advertising at this time, data from the Social Media Marketing Industry Report shows that marketers are also willing to invest in other platforms to see if and how they work. Savvy marketers will note Messenger’s increased adoption and will be formulating a plan to take advantage of this via Messenger ads as chatbot use and Messenger marketing increase. Adobe Digital Insights’ 2018 State of Digital Advertising Report also reveals that 50% of Gen Z (18- and 19-year-olds) and 42% of Millennials (20- to 36-year-olds) think social media is the most relevant channel for ads. With better targeting than ever before, users are reporting the ads they see feel more targeted to them. Young people especially agree with this, and they’re the demographic most likely to turn to social media when researching a new product or service to buy. Additionally, insights from Shareablee’s State of Social TV 2018 report reveals 70% of respondents between the ages of 18 and 24 watch long-form TV shows on various online platforms. 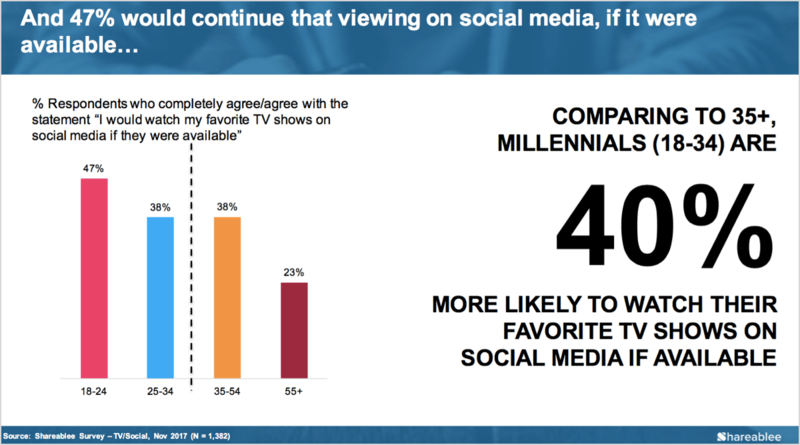 Of that group, 47% would continue viewing their favorite TV shows on social media if they were available there. With that in mind, the launches of Facebook Watch and IGTV signal other viable places for marketers to experiment with in-stream video ads. Indeed, eMarketer reports that spend on social video ads is on the rise and that some advertisers are definitely looking beyond the traditional feed for ad placement. Takeaway: More and more people, especially the younger generations, are looking to social media for answers on what to buy and where to buy it. In-stream video ads during long-form video content may provide a new solution for brands hoping to reach those consumers via paid social. Facebook and Instagram are the platforms on which marketers plan to increase their paid advertising efforts. 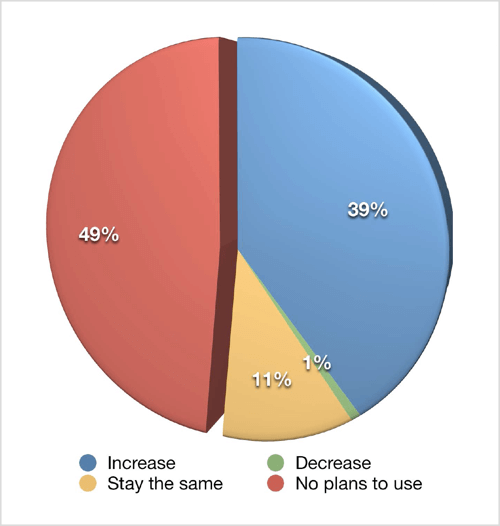 Forty percent of marketers plan to increase their use of Facebook ads and 28% plan to increase their use of Instagram ads. The platforms used the least for ads over the past year are Pinterest and Snapchat. 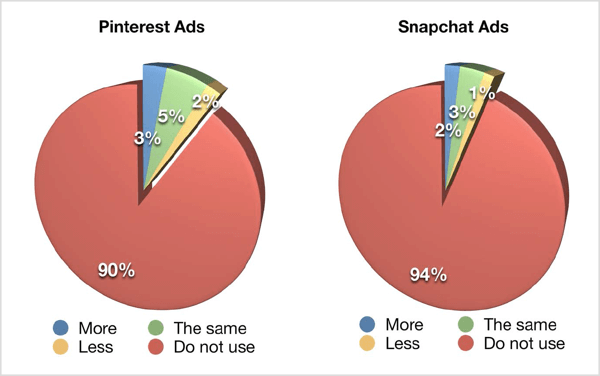 A startlingly high percentage of marketers (90% for Pinterest and 94% for Snapchat) say they didn’t use ads on either platform. 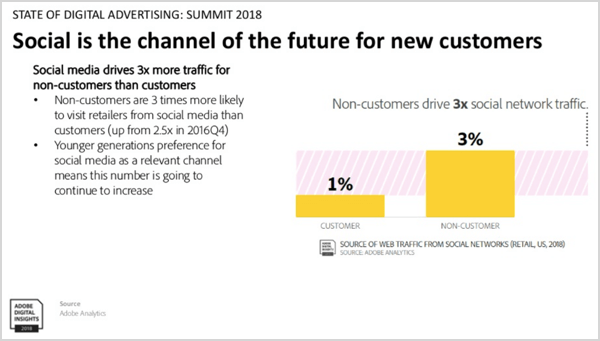 A significant number of those polled said they have no plans to use Pinterest ads (73%) or Snapchat ads (81%) in the future. However, these numbers could look different in the near future. 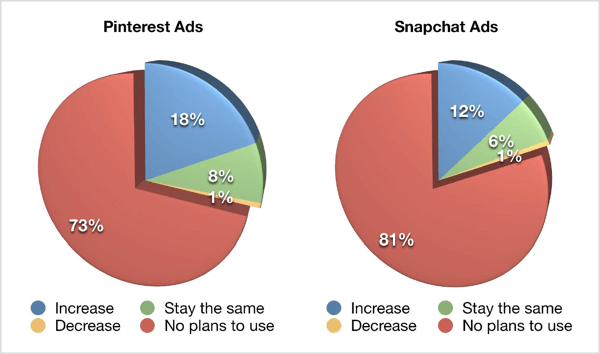 Eighteen percent of marketers say they plan to increase advertising efforts on Pinterest, and 12% plan to increase ad spend on Snapchat. 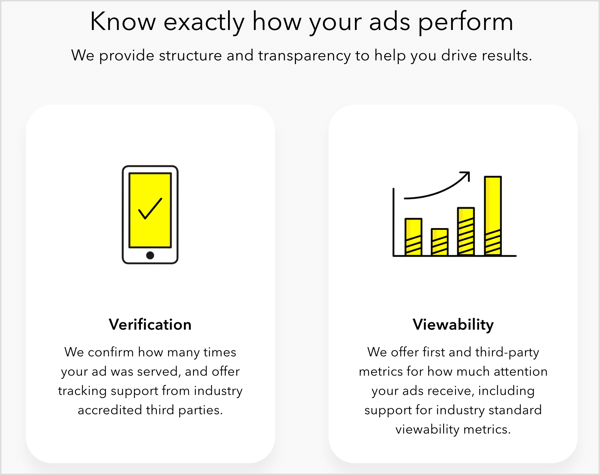 In recent months, Snapchat has taken strides to improve its ad performance metrics via first- and third-party reporting and measurement, perhaps in an effort to further court these newly interested advertisers. Takeaway: Paid social is continuing to grow on all platforms. As more marketers realize the importance of meeting customers where they are, they’ll turn to smaller platforms to reach those core audiences. Click here to find articles and resources for using Facebook ads to promote your business. What do you think? Are you ready to dive deeper into paid social media for the rest of 2018 and going into 2019? How do you think paid social will help you grow your business in the months to come? Please let us know in the comments below.